Home » All Forums » [bacchetta] » Bacchetta General Forum » ROLL CALL! Although this is my first post here, these forums have been a huge help to me already, so I start off indebted to all of y'all even before I've properly introduced myself. I'm a 55-year-old lawyer in Houston. After losing a bunch of weight in 2012, early this year I finally gave in to the impassioned pleas of some cycling friends who'd been after me to buy a bike. I rode 10-speeds in college in the 1970s, but hadn't been on a bike since the late Reagan/early George HW Bush era. But I have a history of low back problems, and after doing some online research I concluded that I'd probably aggravate those on a traditional diamond-frame bike. So after test-driving the Bacchetta line from top to bottom at my very fine local dealer, Planetary Cycles on 610 West across from Meyerland Center, I took the big plunge and bought a CA2.0 in mid-February. Two days later I started a series of training rides with my diamond-frame friends, and on April 20-21 I completed my first major event, a two-day 138-mile Houston-to-Austin ride in the BP MS 150. My odometer is now at 715 after a 22-mile ride this morning, and I'm still LOVING this sport more every day, and loving my bike twice as much. Mine is a standard-spec CA2.0, and I haven't yet upgraded or changed out any of the major original equipment. But certainly in choosing and assembling all my apparel and gear, and in avoiding newbie mistakes that I otherwise would certainly have blundered into on my own, I've benefited ENORMOUSLY from the recommendations and discussion on these forums. Indeed, any time I've got a cycling question now, I start looking here for the answer, since (a) I know the answer I get here will almost certainly apply to my 'bent, and (b) there seems to be a very high ratio of knowledgeable discussion to BS here, as compared to elsewhere. So again, thanks! I look forward to piloting my CA2.0 for years to come, and to these forums as a continuing source of information and, perhaps, new friends! Welcome Beldar! Another lawyer on the forum is always welcome! At least in my opinion....I am a lawyer in Missouri! I've been riding road bikes for many many years. After thousands of miles in the saddle, my body starting crumbling about 3-4 years ago. Several neck and spine surgeries later,,,, I'm pretty much off the DF bikes. My neck and back have never felt better. No tingles in my hands, no more neck pain,,,,, just the great feel of my cushy seat on my Corsa. Bought a Corsa last week. New in the recumbent game. Currently riding a road bike, but curiosity got me in this bike. Welcome to the Bacchetta community. We have a group of of highracers that ride on the west side of Houston, usually out of Katy High School parking lot or Fulshear or Zube park. If you are interested in riding with us, message me with your email address and I can include you on the coordination. Our rides include a CA2, CA1, TiAeros, Corsas, and a Carbent. Hi, I'm Greg. I purchased a Giro 26 ATT from Coventry Cycle Works this spring. I have ridden diamond frame bikes for years and in recent years had been doing mostly mountain biking. About a year and a half ago I broke a couple of vertebrae in my neck while mountain biking and ended up with my entire c-spine fused putting an end to my diamond frame riding days. I started out on a Catrike Expedition as soon as the doctor and my wife would allow it and then this spring got my Bacchetta. In July I completed (in 2 days) the Seattle to Portland ride and had a great time. I hope to try more organized rides in addition to the riding that I do alone. Next years goal is to finish the STP in one day, and then after that who knows. Hello. I am Sam. I picked up a wonderfule used Strada last Sunday and have already put 107 miles on it. In April we bought a Rans Seavo tandem and after riding that on the BP MS150(Houston to Austin), I vowed to never get back on my old road bike again, thus the new(used Strada). We live in the Austin, TX area. I have full partken of the recumbent kool-aid and will not be turning back!!! I wonder if we saw you on the MS150 this year. My wife and I were on a yellow Rans Seavo recumbent tandem. I saw several single recumbents. you may have passed us. Even though there were 12,000 of us, I think we may have been the only recumbent tandem. ONe guy did pass us and said he had one, but his wife wasn't riding this year and was on his single. Hello, my name is Ben Watters. I started riding recumbents, a Rans V-Rex, in 1998. I was going back and forth between uprights and bents for several years. I have owned 2- V-Rex's, built a P38 from a frame only, a Rans Screamer, a Goldrush Replica and recently purchased a Corsa from a fellow forum member. I sold all my bikes, bents and DF's a few years ago (burnout mostly) and started riding motorcycles. Slowly the weight started coming back to the point I couldn't stand myself so I decided I better start riding again. I had a problem with foot numbness on high BB bikes so I am not sure I will be able to ride bikes like the Corsa again. I prefer the SWB and like the riding position so I hope it works out. If not, I will be going back to something like the GRR. The forum has been very helpful in deciding to ride again and what to ride. I look forward to riding with and meeting other Bacchetta riders in the future. Great to hear you are coming back to 'bent riding. I had a V-Rex about the same time you did, and like you I was still dividing my riding time with a DF Trek. Couldn't justify having the V-Rex and not riding it very much so traded it in on a different DF (Trek). Now, many years later... I am "strictly" a 'bent rider and am very anxious to get back to riding in the Spring of '14. Incidentally, I also enjoy riding my Harley Fat Bob, so my riding time is spent between the Bob and my new Giro. Keep us updated on your riding. I had an 07 Ultra and then a 13 Ultra Limited. Loved the big bikes! Too bad we are so far apart, sounds like we would be good riding partners. Hey Gang, Terry Fulnecky here, Goshen Indiana & Sebring FL. December 12th I was 74 but am certainly not the oldest member of the Bacchetta flock. For me, Bacchetta is the fountain of youth and my fitness machine, fell in love with a little Giro ATT 20 in 2010 and graduated to a CA 2 in August 2012. Wife Marilyn and I ride year round and hope to keep on spinning right into the sunset. hi..63 and just started riding first bent...I take care of the neighborhood bikes and worked on a tour easy..just had to test it out! I promptly got on a plane to portland ore to test out what coventry had in stock and rode out with a corsa...did some trial runs down 101 in the redwoods and headed home to kauai to show off to my neighbors..our one road around the island is sketchy but warm and sunny with the pacific always in view..trying to build up the miles before spring moose dodging ride in maine with my AT partner who I have looking for his new bent ride . Larry Tanner, 64, Fort Myers, FL. Purchased a Bacchetta Corsa SS from a private seller in December. I have ridden about 1000 miles and find that I can keep up with the 22-24 mph group even while riding well out of the slip stream. Last year, I was involved in a couple of significant group crashes on my DF bike and decided that it was time for a change. So far, I am learning how to ride a recumbent and I have no plans to go back. I intend to stick with my NO-DRAFTING-for-safety policy. I am impressed with the quality and stability (at speed) of my Corsa. I'm one of the older guys here, 70+ years, but strangely enough my mind is only about 35 (and ageless). Been seriously riding bikes since about 1986. Mostly DF road bikes (Treks), in my younger days. Most Centuries in one year was 7 (with the local Club). Kind of "burnt" myself out on them. 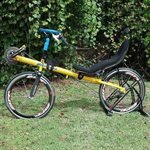 About 5 years ago, gave up the DF bikes and went to a Catrike Expedition. Lots of enjoyable miles on it, but.... middle of last year decided to try a two-wheel recumbent (for some variety). Went with a Cruzbike (Quest). After making it through a "steep" learning curve, I discovered a mechanical problem that could not be fixed to my satisfaction - so returned the Cruzbike to the distributor. Nevertheless, I really loved the ride and experience of the two-wheel recumbent, so went looking for another. Late last Fall, after much research and some test rides, I decided on the Bacchetta Giro 20. Plus, I had it upgraded to X9 Shifters, Euromesh and disc brakes. Only got to ride it a couple of times before the weather (here in the Midwest) shut me down. Been riding it on a trainer for the last couple of months, also tweaking all the adjustments and getting the seat and handlebars just perfect. Really looking forward to Spring when I can get it back out on the roads and bike path. Of course at my age, I only ride for exercise now-- no more really long miles. But I do enjoy several weekly rides when the weather permits. I'm Jon, 41, in SW Ontario, and just at the w/e I collected my new-to-me 2009 Corsa 650c. I've had a Catrike Speed for the last four years but decided that a two-wheeler would better suit the kind of riding I do nowadays with my local club, so I bought and sold through BROL and I'm just thrilled with my new bike. Two rides so far - very much the baby deer wobbling around at starts and stops but that's hardly surprising as I've been used to three wheels exclusively for 4+ years! Once I'm rolling, it all feels great. I've ridden my trike at the last four Calvin's so I've ridden alongside some of you already :) I'm looking forward to doing it again on the Corsa. The forum's a pretty great resource so far and I hope I get to contribute more than just questions before too long. I'm Wayne from Lake Jackson, TX, 62. I bought a Corsa from Planetary Cycles in Houston last December and have about 1000 miles on it. It was quite an upgrade from a Trek Hybrid that I was really enjoying, but which was also contributing to some neck and back pain. I ride mostly for keeping fit and I'm pretty new to biking in general and the Corsa was really a paradigm shift - but a great one! I'm putting in about 40 - 50 miles per week, mostly just around town. But I have a gleam in my eye to do the MS150 next year. I think this forum is a great source of information from people who have a lot of experience. I'm looking forward to learning from you. I'm happy with the replacement: Ti-Aero... this AM did 27miles at average moving speed of 20 with 1K of climbing. Excellent! Riding to keep the temple in working order, Riding to keep the earth green, Riding to be a healthy father, Riding with my wife. Rod Owen from Huntsville AL. 56 years old, coming from a triathlon, marathon background. Not fast but sure. Retired Marine. Bought my Corsa 700c while out in Austin TX right after Sebring 24 hours which I did on a DF. Too much pain just to travel 223 miles. Just finished the Mid Atlantic 24 and hit my goal of 300 miles by 5am. The goal is now 400 miles to qualify for RAAM. Looking for interest in a recumbent team for RAW next June.